The college sector is facing a growing number of new challenges caused by technological change, globalisation and the growth of mass higher education. 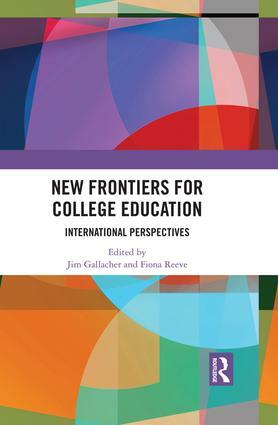 New Frontiers for College Education considers the impact these changes have had and explores the developing role of college education in countries throughout the world. Whilst analysing the issues associated with providing high quality vocational education and training, the book also reflects on the role of colleges in widening access to both further and higher education. Drawing together contributions from leading international academics, policymakers and practitioners, the book explores common themes across these diverse societies, as well as some of the key challenges experienced within individual countries. It considers the distinctive contributions that colleges can make in responding to these challenges through apprenticeships and other types of vocational education and training. Contributors discuss the growing emphasis on creating more integrated systems of tertiary education, recognising that colleges and universities are now expected to work more closely together and that these diverse demands can be difficult to reconcile. Providing an authoritative and timely analysis of the changing role of colleges in contemporary society, this book will be of great interest to academics, researchers and postgraduate students in the areas of further and higher education, vocational education and training, lifelong learning, and skills development. It should also be essential reading for policymakers, as well as practitioners working in colleges and other institutions of higher and further education. Technical and professional education – a defining role for further education colleges? Is there a higher level skills gap that colleges can fill? How are ‘applied degrees’ applied in Ontario colleges of applied arts and technology?